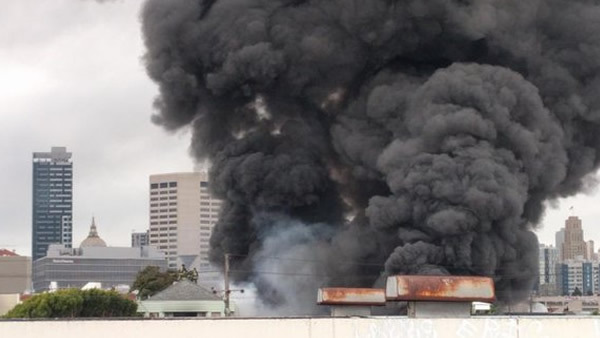 SAN FRANCISCO -- A fire consumed a tire store at 16th and Shotwell streets in the Mission District on Sunday. It was burning so intensely, thick, black smoke could be seen for miles, as far away as Marin County. Officials said 17 adults and four children have been displaced by the fire as flames spread to an apartment building next door. "It was scary," Matthew Hernandez said. He jumped out of bed Sunday morning and grabbed his dog, Tino, after his dad Ceasar sounded the call that there was a fire burning next door. "I said, 'FIRE! FIRE! You gotta get out, yeah," Ceasar recalled. The fire at Rolling Stock Tire Shop was intense and quickly jumped to three alarms. More than 100 firefighters attacked the flames from all sides, fueled by burning tires. The thick, black smoke could be seen for miles. Early on, the roof of the shop collapsed. "There's a heavy amount of material inside. When the roof collapsed, it fell down on the fire. Structural integrity, we didn't make entry to the building," SFFPD Asst. Chief Dave Franklin said. "I said oh my God, our building's going to collapse. Flames are right near it," fire evacuee Norma Pizarro said. Pizarro was one of the 21 residents who ran from their green, three-story apartment building on 16th Street. "We're right next door. If it goes up, it's going to go up bad," evacuee Oscar Lepe said. Lepe shot cellphone video moments after the fire erupted. Luckily, firefighters saved the apartment building but fire, smoke and water damage left it red tagged by city inspectors. "The main thing was no one was hurt," said Jim Albera, who owns the building that was destroyed by the fire. Albera believes it may have started from garbage dropped by next door tenants onto his roof. "They throw stuff out of the windows, garbage. We cleaned 5, 6 sacks when we were cleaning gutters for rains," he said. Firefighters have not determined a cause. There were 20 people working at Rolling Stock Tires, all of them now out of a job. The Red Cross is assisting nearby residents who were displaced by the fire. Red Cross volunteers have opened an evacuation center at 520 S. VanNess for residents impacted by this morning's SF's Mission District fire.